One of the larger open spaces within the Guadalupe River Park, Confluence East is comprised of multiple sites capable of hosting events of all sizes. These areas are isolated from one another geographically, allowing them to have different characters and provide different amenities. They include places of shade, refuge, and reflection, as well as large open meadows for active play such as Frisbee and kite flying. The park promotes visual access to the river, and creates areas for picnics and group activities. The Plaza areas in Confluence East celebrate the various meanings of confluence and establishes an identity for the area within the framework of the rest of Guadalupe River Park. Above all, Confluence East is designed to integrate various fractured elements, connecting the city to the river, connecting the park’s two halves across St. John Street, and relating the river to the flood-control culvert. Confluence Point marks the coming together of Los Gatos Creek and the Guadalupe River, and is perhaps the most beautiful spot from which to view the confluence of these two bodies of water. This area is also celebrated as a confluence of ecology and technology and of multiple ethnicities and cultures, reflecting San José’s multi-cultural society. Braided paths and special paving materials reflect the patterns of the river’s flow. Confluence Point is the location of an art installment honoring the Costanoan-Ohlone people. Adjacent to the Santa Clara Street Overlook Plaza, this monument celebrates the confluence of the Guadalupe River and Los Gatos Creek. Designed as a circular, site-specific art piece, the monument consists of two spiraling patterns swirling into a central focal point and carrying the names of the tributaries to the two rivers. The names are carved into two bands of gray and red granite, leading to the central focus, a black granite disk. Granite seat walls edge this triangular plaza, and a group of evergreen trees provides shade and a green backdrop. Its pointed elliptical shape and line of benches recall the forces of a river system as it braids and flows, the ellipse being the primary form left as avoid between two braiding river channels. This elliptical form is used throughout the Guadalupe River Park. The plaza overlooks the primary inlet for the flood-control culvert and provides space for respite and education. Located adjacent to the secondary inlet for the flood-control culvert, this plaza highlights the civil engineering system that has been constructed to protect people and property in downtown San José. It also seeks to illustrate the integration of the natural river system with the flood-control system by showing how water from one is carried through the other in times of floods. The design of the plaza consists of a narrow, trumpet-shaped space where two walks, representing the two streams and their corresponding culverts, converge into one. Graphics in the paving or on separate signage illustrate how much water is carried in each culvert. 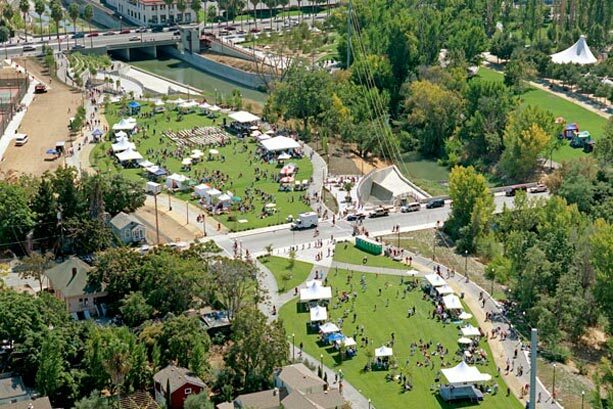 The central feature of the plaza is a triangular wedge of granite, sandwiched between the two walks, that points directly to the confluence point of the Guadalupe River and Los Gatos Creek. Four tennis courts near the River Street Historic District offer the opportunity for active recreation in Confluence East. Aligned end-to-end, they lie along the line of the Guadalupe Parkway. This plaza celebrates the historic users of this site and is also the location where the two winding paths of Confluence East cross. Visualized best as a triangular crossword puzzle, the monument design represents the intersections of different cultures on this site. Their names are written in carved granite. The Guadalupe River Park Conservancy provides community leadership for the development and active use of the Guadalupe River Park & Gardens through education, advocacy and stewardship.